Terror Victim's Family "Resolved to Fight Injustice"
Just before the explosion, Yekutiel Wultz saw the man flash "an evil smile." Wultz, known as "Tuly," was eating with his son Daniel outside a food stand at Tel Aviv's Central bus station in April, 2006. The smiling man, Sami Salim Khamad, was sent by the Palestinian Islamic Jihad and blew himself up an instant later. Eleven people would be killed, including Daniel Wultz. The South Florida resident died four weeks later after enduring respiratory problems, gangrene, infections, shock and other injuries caused by shrapnel. He went through 200 units of blood. Tuly Wultz was severely injured, but survived. He remains hampered physically and emotionally. There's a constant ringing in his ears. His mobility is limited. And his mind repeatedly flashes back to his son's murder. "I suffer nightmares, also what I call 'daymares,'" he said in an interview. "I can be in a traffic light and all of a sudden everything flashes back. I can't move … It's constant. It's something I have to live with." Some people might wilt, unable to overcome their grief. The Wultz family chose a different path. 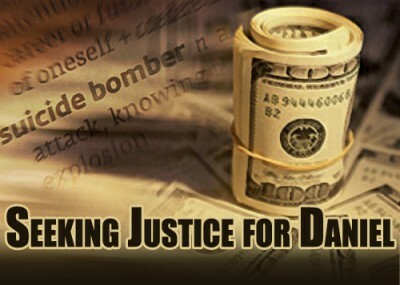 A federal judge awarded the family more than $330 million in damages May 17 in a lawsuit they brought against the governments of Iran and Syria for their responsibility in financing, training and otherwise supporting the Palestinian Islamic Jihad (PIJ). Similar claims against Iran have resulted in billions of dollars in damages. This is the first judgment of its kind against the Syrian government. The two nations, both vulnerable to litigation as State Department-designated state sponsors of terrorism, "funneled money through the Syrian Defendants to the PIJ in order for the PIJ to carry out terrorist attacks," wrote Royce Lamberth, chief judge of the U.S. District Court in Washington, D.C., in his ruling. "The evidence also establishes that the safe haven, advice, encouragement, assistance, and facilities provided by Syrian Defendants substantially contributed to the PIJ's ability to train suicide bombers." The ruling has provided some solace for a family still grieving Daniel's death. "He is a hero now," Tuly Wultz said of Lamberth. "The message that he sent couldn't be better." The decision to go to court was not easy. "Here, people don't understand," said Tuly Wultz, who grew up in Jerusalem and moved to the United States in his 20s. "They don't understand the risk of not doing anything, the dynamic of letting the bullies get away with what they do. If this will prevent one more Daniel from being killed, we did a great job." They created the Daniel Cantor Wultz Foundation "to educate people on the nature, tactics and goals of terrorism, promote global strategies for eradicating terrorism, and encourage socially responsible, ethically guided behaviors that contribute to a safe and peaceful world." The Wultzes have spoken to at least 10,000 people and made a presentation before members of Congress on Capitol Hill. "We speak where ever we can," Tuly Wultz said. His message is clear: "Never give rewards to the aggressors. We have to learn from history. The Allies tried to appease Nazi Germany when they gave them Czechoslovakia. It showed how weak the Allies were. " His own family history offers similar lessons. Wultz's father survived the Holocaust. He was 92 when Daniel was killed. He made Tuly promise not to let the tragedy destroy him. "Choose life," Tuly remembered his father saying. "I did. So will you." Tuly Wultz's brother-in-law lost a cousin on 9/11. His son Daniel was murdered 5,000 miles away from home. "It doesn't matter where you are," he said, "terrorists will attack us everywhere if we don't fight them." The family intends to collect on Judge Lamberth's order. But that task may prove more difficult than proving who was responsible for Daniel's death. Lawsuits like this are possible thanks to a "terror exception" Congress added to the Foreign Sovereign Immunities Act. While most nations are exempt from civil damages in U.S. courts, that protection does not apply to those labeled as state sponsors of terrorism. But while one branch of government opened the door for victims to pursue justice, another branch has made it policy to block them from collecting. When victims of terrorist attacks and their families try to enforce similar judgments, they must overcome the objections not only of the targeted country, but also from the U.S. State Department. "There's almost an institutional State Department ideology that terrorism victims are little bugs that get in their way every once in a while," said Rhode Island attorney David Strachman, who has represented families in cases similar to the Wultz lawsuit. He described one hearing in which counsel for the Iranian government deferred to the State Department's argument in opposing terror victims' claims. This situation has held true through Democratic and Republican administrations. Allowing the assets to be taken "can have a significant, detrimental impact on the conduct of our foreign relations," Fox News quoted the Justice Department saying. When assets are in play, there often is a line of people ready to claim them. That's not the case yet with Syria, but it's likely the State Department will oppose any effort by the Wultzes to attach those assets. Tuly Wultz is aware of such obstacles, but undeterred. "We're not limited to the United States. We're going to enforce the judgment everywhere we can," Wultz said. His case was helped by the Israel Law Center, which claims to have secured $72 million "that went directly to the victims and their families" in similar cases. "This court decisions shows that even outlaw regimes like the one in Damascus can have the rule of law imposed upon them," center director Nitsana Darshan-Leitner said in a statement. The family plans to use money it obtains to spread its message against terrorism. Every dollar they collect, Wultz reasoned, is a dollar that cannot go to plotting an attack or training a terrorist. Though each day poses its own challenges, the Wultz family has found ways to find joy in life. Tuly and Sheryl are the proud parents of a grown daughter and a 4-year-old son, their "miracle boy." Their determination and spirit clearly moved Lamberth, who heard evidence and testimony during two days of proceedings even though the Syrian and Iranian governments did not contest the litigation. Those states deserve "unadorned condemnation" for using terrorism as state policy, he wrote. "Barbaric acts like the April 17, 2006 suicide bombing have no place in civilized society and represent a moral depravity that knows no bounds," Lamberth wrote. "In stark contrast to the Iranian and Syrian thugs stands the courageous Wultz family. The Wultz family resolved to fight injustice with whatever tools were at their disposal, and their patient determination over the last six years is a credit to both themselves and to the memory of their beloved Daniel. This Court hopes that [the] Wultz family may take some measure of solace in this Court's final judgment." What good are court decisions if not carried out? If victims of terrorist attacks cannot depend upon receiving the money the court awards them because the U.S. government blocks their dispensation, what kind of justice is it our own government doles out? If the U.S. government will not defend its own citizens against terrorist attacks as it refused to do in the Benghazi attack, and will not move mountains to ensure the compensation for terrorist attacks is not given to its victims after a court determines they are due compensation, what exactly is the role of the justice department? Are our enemies being protected by our own government while our citizens being thwarted? That seems to be the case.